It is time to introduce you to one of my favourite things...kale! Don't turn your nose up at me. Kale is good for you. Uh oh, did I just sound like my mother? But kale IS good for you. And it is incredibly tasty too. Greens are really the mother of all vegetables. If I had to exist on only one vegetable (which isn't really a good idea but if I was forced to pick just one) I would choose kale. 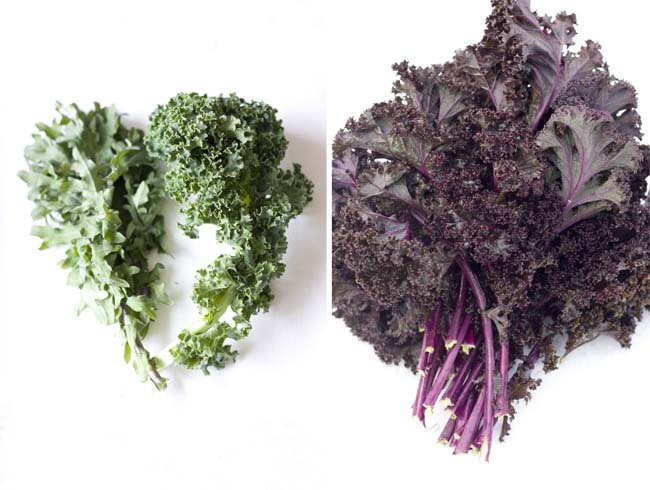 Incredibly high in vitamins A, K and C, kale also boasts folate, omega 3 fatty acids and iron. Not too shabby for a leaf normally relegated to lining the deli case. A true superfood, kale is chock full of antioxidants to help combative oxidative damage and calm inflammation. From flavonoids to lutein to I3C, antioxidants in kale help to support detoxification pathways in the body and combat chronic disease. The key to kale is finding a way to cook it that you love. Some like to juice it (not for the novice juicer!) or shred it into salads; others to bake it into chips, saute it or toss it into soups. This week, get to know kale and eat it at least once. I hope you will like it so much that kale makes it into your weekly grocery list. There are a variety of different kales out there and the farmer's market is the perfect place to select your favourite. If the kale on your grocery store shelves looks moth eaten and tough, move on. You won't like it and you will blame the kale, not poor quality product. To help get you inspired, I will be featuring a post from my first guest blogger (drum roll please!! ), Melissa Quantz, at www.thebountyhunter.ca . Melissa has created a delicious pasta dish for you which I will post this Sunday. I love the Green Lentil, Kale and Spinach Soup recipe in your cookbook, A Local Table. Delicious! Mmmm, kale. Love it. Thanks for the feature Desiree.